New Delhi, April 16 (IANS) India skipper Virat Kohli and the five wise men -- selectors -- led by M.S.K. Prasad may have decided to back experience while picking the 15-member squad for the World Cup in England and Wales, but former India opener Gautam Gambhir feels they may have missed out on thinking out-of-the-box and bringing in a few unknown faces to take the opponents by surprise. Speaking to IANS, on the sidelines of the CricPlay media round table, Gambhir said it was for Prasad to show faith in the youngsters and back them. However, the 2011 World Cup winning opener also added that if the current selectors feel this is the best team, then others should support them. "I don't know. It is ultimately about MSK because it is not about people who have experience. It is about what you think is right and that doesn't come with experience, it comes with belief. "If your belief is strong enough, it doesn't matter if you have played 100 Test matches or you haven't played a single Test. It is your belief and confidence that matters more than anything else. "Whether they have picked bits and pieces players -- that is what the selectors, the captain and the team management needs to decide. "Ultimately we want the Indian team to do well and try and win the World Cup. If they think this is the best 15 that can achieve that, we have to support them. I love thinking out-of-the-box and that is what I always did," he said. Asked if it was unfair on Rishabh Pant as the selectors picked Dinesh Karthik over the youngster, Gambhir said that he was equally sad for Ambati Rayudu and that Pant still had age on his side, but Rayudu doesn't. "Why speak about only one player? There is Ambati Rayudu who missed out as well. He is averaging 48 in ODIs, why focus only on Pant? I feel it is far more disheartening for someone like Rayudu because Pant has age on his side. "Rayudu doesn't have age on his side and we should be talking about Rayudu because Pant is at least playing one format of the game," he pointed. Commenting on the current squad, Gambhir said that this time the bowling unit looks better than the one which helped India win the World Cup in 2011. "We have the experience of Dhoni, who is playing his fourth World Cup. We also have Hardik Pandya who has an X-factor, but we have a better bowling attack this time than what we did in 2011. "We have Jasprit Bumrah who is at present the best white-ball bowler and that is why I think this bowling attack is far more better than the one in 2011. It is on the batsmen to now put the runs on the board. "This is a format where you have to be the real world champion to win the trophy because whoever wins will have beaten all the other teams in the world," he said. Talking of backing players, Gambhir is often seen as the man behind the rise of pacer Navdeep Saini, but the former opener feels it is the bowler's credit that he has constantly worked on his game. "You have to give credit to him. I backed a talented player. As a captain my job was to give opportunity to the talent. It was ultimately up to him as to where he wants to take that opportunity. He is working hard and clocking 150kmph. There is nobody in India who is clocking that pace and that is why I had picked him in my World Cup squad as I felt he could be the X-factor. "We had picked R. Ashwin in the 2011 World Cup because we thought he had the X-factor. He was an unknown commodity and he did wonders for us in the game against Australia. Not many people in world cricket is bowling at 150kmph at present and that is why I felt the unknown factor could have worked," he explained. 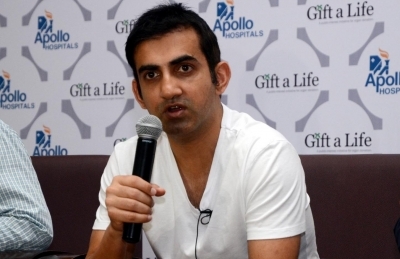 Commenting on his involvement with CricPlay, Gambhir said: "It is a great stress buster for me. Whatever you do, you are still a leader and you want to think as a leader and that takes your mind away from other things. I get to play against people across the country and I love that." Business head Gaurav Sarin added: "We honestly believe if we touch you in a positive way, we can find a better way to make money than asking the users to pay to play. People aren't playing this for money."